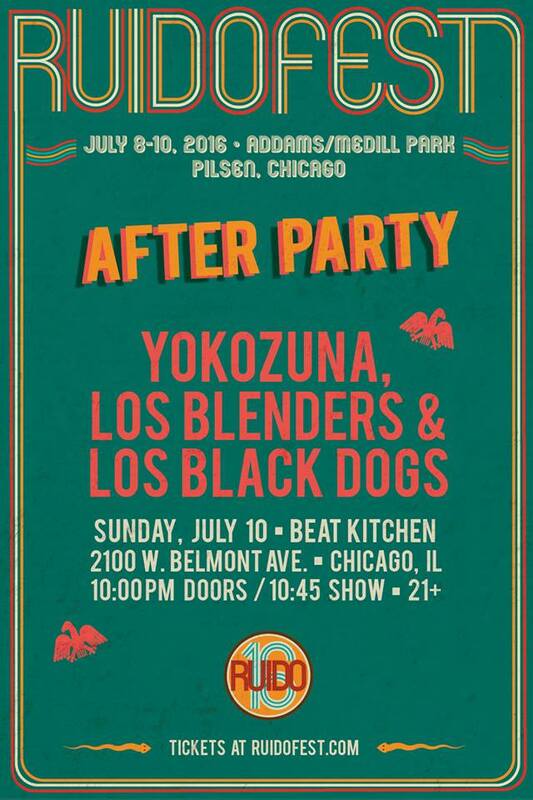 Kesta Happening » Blog » Ruido Fest Promises to Satiate Hungry Latin Alternative Festival Fans in Chicago this Weekend! 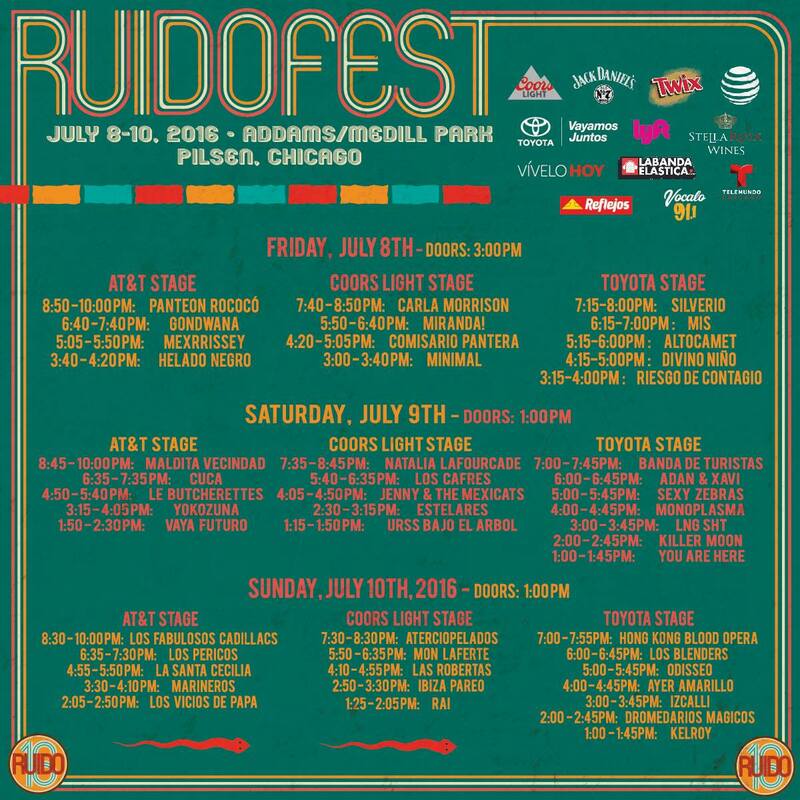 UPDATE July 7, 2016 - 12:00 PM - RUIDO FEST SET TIMES! UPDATE July 7, 2016: RuidoFest announced in a press release that La Ley cancelled their Friday appearance at RuidoFest due to "unforseen circumstances". La Ley will be replaced by Chilean Reggae band Gondwana. The release read, "Organizers of Ruido Fest are disappointed that La Ley is unable to participate in Ruido Fest but are excited to announce that GONDWANA will be taking their place." Gondwana is one of the most celebrated reggae bands in South America. You used to have to travel to Mexico's Vive Latino or Brazil's Rock in Rio to see many Latin Alternative rock artists in one place over a multi-day festival. Well not anymore! Ruido Fest, now in it's second year, will satiate hungry festival goers with a 3-day multi-stage outdoor Latin Alternative festival sure to set a record this year!! For me personally, after attending 5+ Vive Latino Festivals in Mexico City and living some of the most unforgettable moments to include watching the Caifanes reunion after 15 years in 2010, or Los Fabulosos Cadillacs in 2013, it was somewhat disconcerting that these festivals often had American or international bands headlining. The year of Los Fabulosos it was Blur and the Yeah Yeah Yeahs co-headlining. I was very happy to see that Ruido Fest stuck to Latin Alternative classic artists like Fabulosos Cadillacs and La Ley and served them up with more up-and-coming artists like Jenny And The Mexicats, Le Butcherettes, Divino Niño, Monoplasma and many more. That's almost unheard of if you're in the states where major tours usually stick to the classics and leave out up-and-coming bands. The closest thing we have to a festival like this in the East Coast are the free shows associated with the Latin Alternative Music Conference (LAMC) in NYC (always fun but not an all-day festival with concerts often spread out among various venues). For the West Coast, it is much more common for Latin artists to perform in large festivals such as last year's Tocada Fest which brought Los Amigos Invisibles, Tijuana No, Julieta Venegas, Hombres G, Enanitos Verdes, and Caifanes to hungry festival fan-goers in 2015. Not to mention SuperSonico, Reventon Super Extrella etc. etc. you get the picture. The art of the music festival is one you have to experience at least once (or a million times) in your life. There's something about going to an outdoor music venue at 11am and not coming out until past midnight that really gets the adrenaline going. When there are multiple stages, it is an art to know the precise moment to leave one stage to make sure you have time to get to the next stage (and grab a drink or take some epic pics along the way). All the adrenaline eventually culminates into a fantastic jubilous crash that you will never forget. 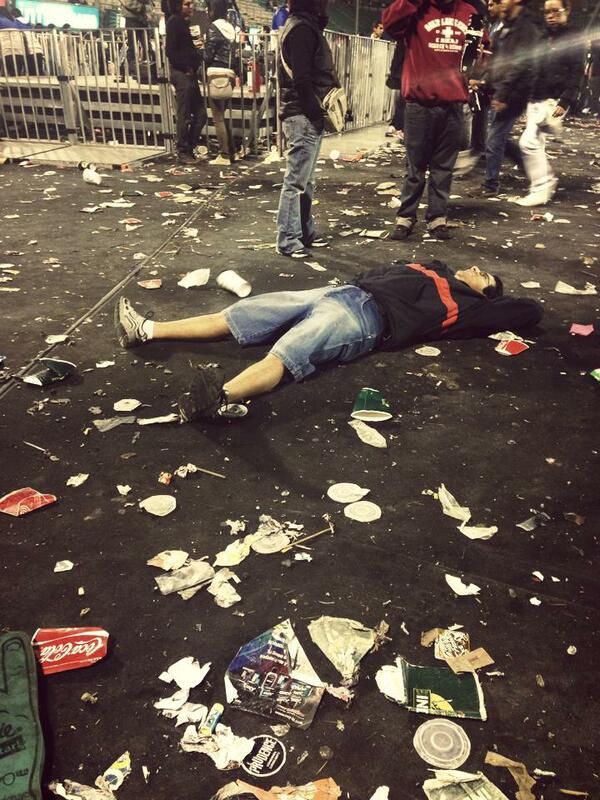 In looking at pictures of Vive Latino's past, I came upon one picture I took of an exhausted Mexican fan, splayed out on the floor, one shoe missing and gazing at the stars as festival goers walked around him. That really sums up my thoughts on Festivals... you will be tired, hungry, and the happiest you've ever been after you attend one. 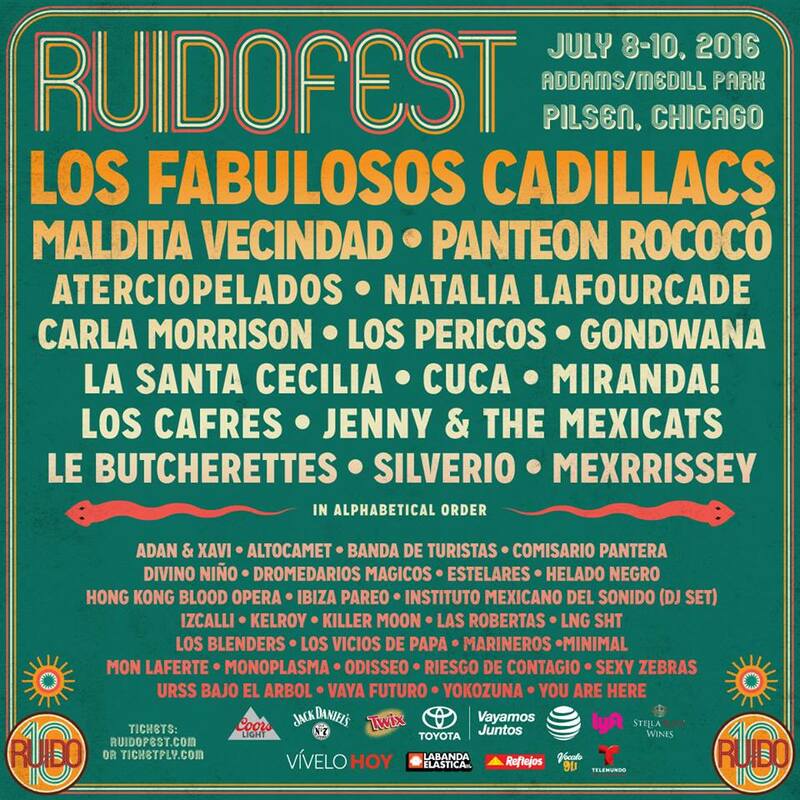 This year's Ruido FEST is to take place on the weekend of July 8th, 9th, & 10th at the ADDAMS/MEDILL PARK in Pilsen-Chicago. More than 40 acts that together represent today's wide variety of Latin music culture will be featured in the 3 day festival for the second year. When we say things got bigger... they got bigger. Toyota is one of the sponsors and will feature an on-site interactive display along with other activities for fans to explore in between bands. Coors Light, Jack Daniel's and Twix will also have activities and free samples onsite. Keeping things connected to the community, Ruido Fest organizers also brought in some non-profit organizations who will join the festival this year to help the Hispanic community in important issues such as Mujeres Latinas en Acción and Yollocalli Arts Reach, an open community space that provides free arts and culture programming to young adults. Ruido Fest is really unlike any other festival happening in the US right now. While other festivals have done the one-day thing, having a 3 day spread with the amount of bands scheduled takes some real pro-work. 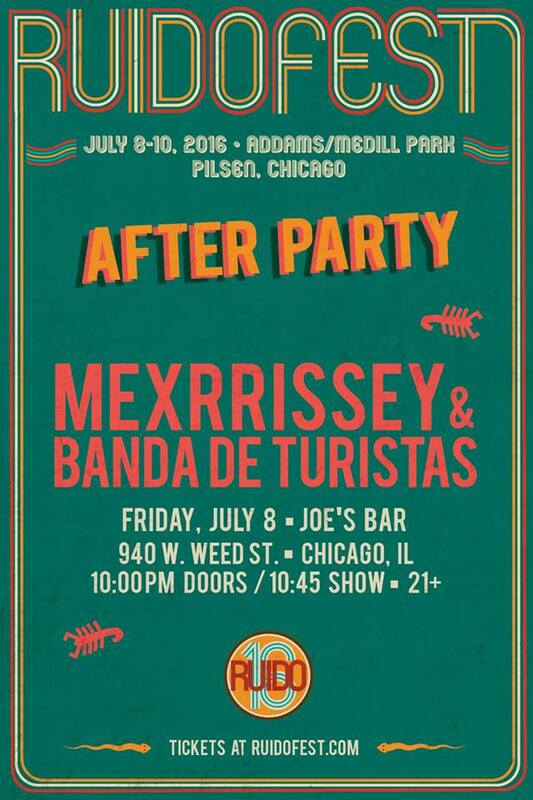 Rock Sin Anestesia, Riot Fest, Metronome, and Star Events, are the principal organizers behind Ruido FEST, and are some of the most experienced large-scale event organizers in the country, with strong ties to the Chicago Latin music industry and to local area communities. Because partying for 10 hours is not enough.. here's the afterparty info. 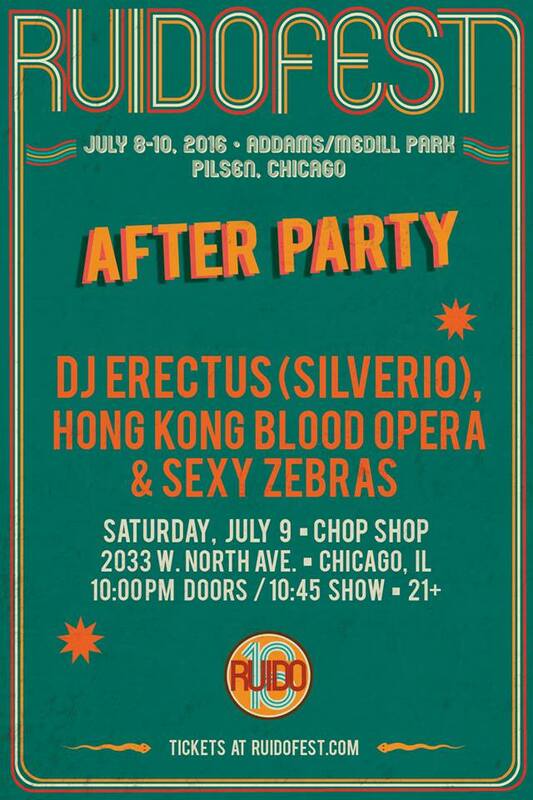 And of course there is an afterparty for Sunday as well...what are we? Amateurs? You heard it here. Our bags are packed and I will be joining the Ruido Fest mania making the trip to this one-of-a kind event. If you are still looking for tickets you can check out www.ruidofest.com to see what is available. Some of the cheaper 3-day passes are sold-out with only VIP packages remaining. (VIP Admission Includes: Express Entry Gate, Wristbands for Ins and Outs, Access to VIP Lounge, Seating and Viewing Areas, Complimentary Bottled Water, Private Air-Conditioned Restrooms, Premium Beer & Spirits Bar). Sales for tickets are available via Ruidofest.com and Ticketfly.com. For more information, visit Ruido Fest on Facebook and #ruidofest on Twitter! See you at the festival! 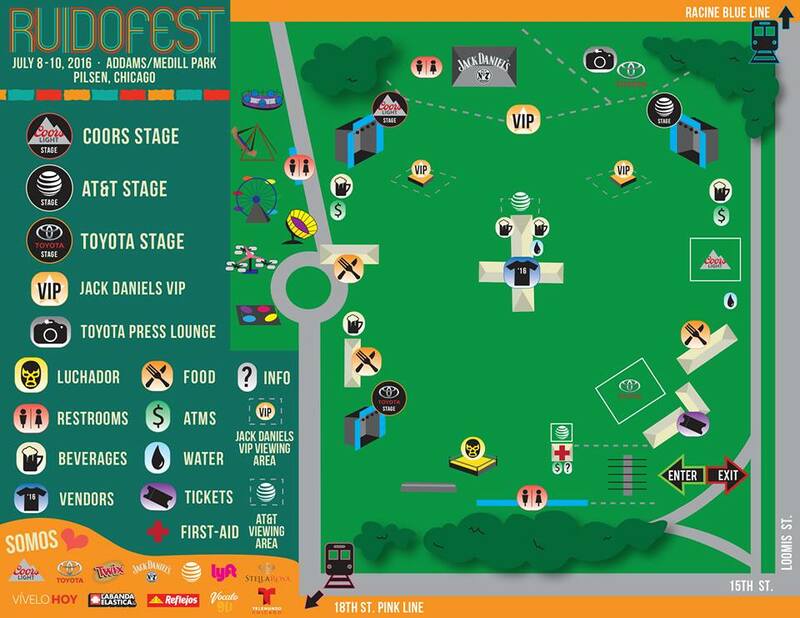 Here's a layout of the Festival grounds!